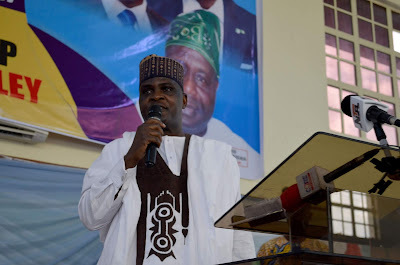 One of the Leading guber aspirants under the platform of the All Progressives Congress (APC), Alhaji Lai Yakubu Garba Gobir (The Wazirin Hausa), has debunked the rumours circulating on social media that he is an agent of the Senate President, Dr. Bukola Saraki. While addressing the pressmen in Ilorin, he said, "I was so surprise hearing this for the very first time. But well, I am not also surprise in the other hand, because the moment I make up my mind to contest I have prepared myself for the worst". "I have my own business that took me 20 years to build from nothing, and Allahamdullihi my needs are covered. So it will be a shame on my personality if one man can hire me to work for him as an agent of destruction in my own party; and I go against my own people. "It is demeaning to link me up with Dr Bukola Saraki as one of his agents, because for once I have never been one of his beneficiaries. I just believe this is an attempt to soil my name." He further said, "I want to make this clear to the entire people of Kwara that, I, Yakubu Gobir, have never have anything to do with the Saraki. I only know Sarakis as a family like every other Kwarans, but I have never done anything with Bukola before and I can never have anything to do with him. "So over this rumour that I am a mole in APC, please disregard it, it is not true. I am only in this race to offer myself for service because I have always believed Kwara and Kwarans deserve better, and to me, it is not a "Do or Die" affair".